Here are all the supplies (minus the water can for our compost tea) we used to amend our soil for the winter growing season. You may recall that a few weeks ago we received the results of our most recent soil testing. There was nothing unexpected there. The phosphorous was extremely high, as we had discovered that it was the year before. The nitrogen was relatively low, as one might expect after a year of growing. The Ph was holding steady at 7.5. What? Wait a minute. How had we missed this before? A Ph of 7.5 is alkaline and much too high for the plants we were trying to grow. It finally jumped out at us. Whatever combination of knowledge and experience was required to realize this, we had finally acquired and decided to take some action. When I turned the beds this week, I started applying a system or soil amendments designed to create a vibrant and fertile environment in which to plant our winter crop seeds. Here is a close up of the soil amendments before I raked them in. Included here is blood meal, sulfur, and dried molasses. I could not simply throw on the standard organic fertilizer, because this would contain phosphorous which would exacerbate the anemic conditions already created by our high phosphorous levels, so I choose to apply Blood Meal instead. Blood Meal is pretty much exactly what you expect it to be based on the name. Its a dry powder made from blood, and it is a pure nitrogen fertilizer. Exactly what our garden needs. There are a few ways to address the high Ph level condition, but the most common is the application of sulfur. The sulfur we used is actually broken down slowly over time by the bacteria in the soil. The by-product of this bacterial breakdown is acid which lowers the Ph of the soil making a better habitat for the plants we are growing and the many organism that live in harmony with them. 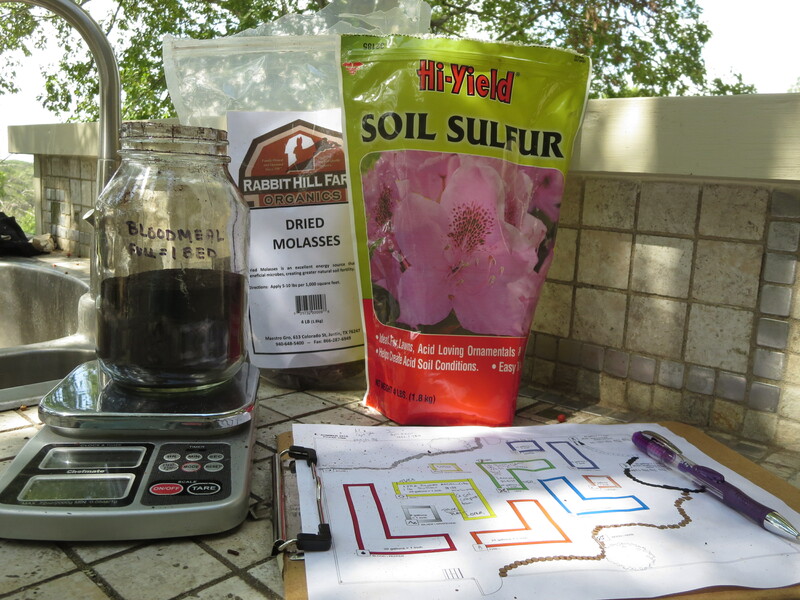 I added molasses to the soil this year to try to kickstart the microbial activity of the beds and aid in the breakdown of the sulfur into acid. Molasses is simply a sugar application which feeds those bacteria, helping them be healthy and strong. Its sort of like the work we do in fermenting, feeding sugar to the good bacteria to help them grow and hopefully overwhelm any bad bacteria or simply live through the barren times when the plants are not making food for them through the energy of the sun. Finally, I watered all of this in with compost tea. In addition to the assorted vitamins and minerals that have been extracted from our food waste during the composting process, the compost tea is also infused with all the tiny microorganisms and bacteria that make compost cook in the first place. This compost tea, soaked into a freshly sugared and fertilized soil, should provide our beds with a healthy and vibrant crop of microbes to build a healthy ecosystem. Here is a view of our new mulching technique, the beds covered in a blanket of leaves, just like a forest floor. Once the bed was properly amended with these special ingredients, I went back into them and planted the seed for the winter crop. There was one final step after that which is also looking good so far. I did away with all of our old chipped wood mulch and replaced it with a layer of decaying leaves that I collected from around the property. 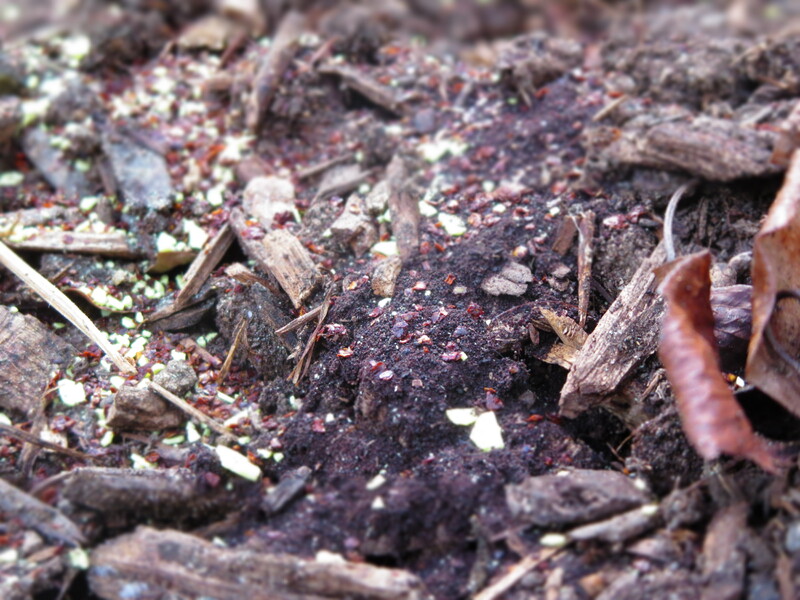 Yes, the wood mulch does an excellent job of shading the soil and keeping it nice and moist in the beds, but it may also be harming the nutrient levels of the soils because of the intensive work required by the microbial community to breakdown the materials. Too many nutrients get locked into that cycle and are not available to the plants to use for food. With the decaying leaves, I more closely mirror the forest floor, keep the beds moist and shaded and provide nutrients more quickly to the roots of the plants. 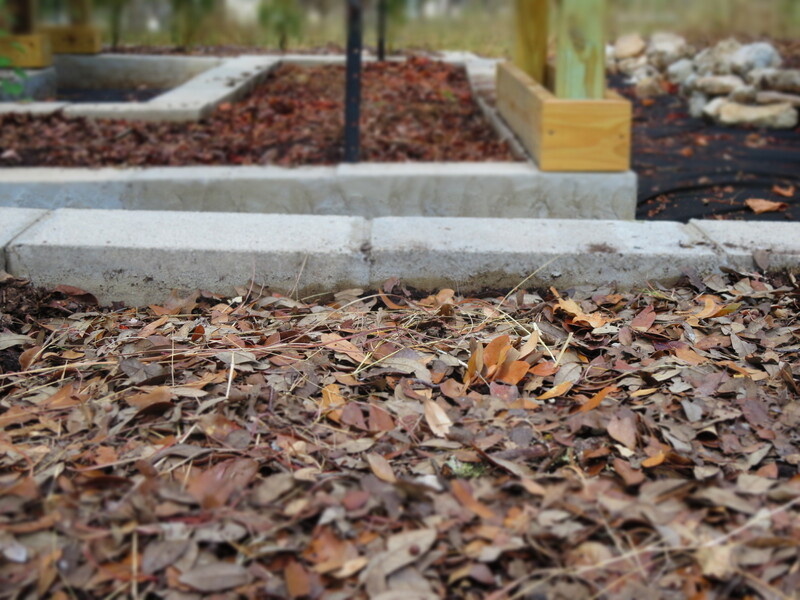 It does create quite a bit of work, finding enough leaves to cover all the beds, and I find that the leaves of the live oak trees do not work nearly as well as all the red oak and hackberry, but it already seems to be a big improvement over the wood chip method.